Bike riding is a very enjoyable activity enjoyed by millions of people. But, for years men and women alike have suffered the most unbearable pain caused by inadequate bike saddles. The number one reason so many individuals give up bike riding is SEAT PAIN! 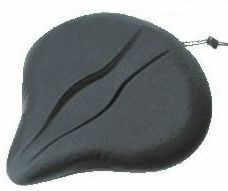 Gel bike seat cover to fit the large size bike seats and exercise bikes. Slips over existing seat in seconds! Add that extra comfort you need. Fits seats up to 12" to 14" and up to 13" long 1-1/2" thick and weighs over 3 lbs! Easy installation. Just slip the medium gel bike seat cover over your existing bike seat and adjust the the locking drawstring for easy installation and removal. Great for exercise bike seats!